Ok I having a Supfast moment. That is the meal between supper and breakfast. Why has krispy kreme tank in sales.. I heard it was due to health craze of the nation trying to avoid carbs but Dunkin Doughnut is now popping up everywhere. Are Dunkin Doughnuts shipped in Daily how do they serve fresh doughnuts or is full of preservatives to make it taste ok? Some like their coffee but I always have to get a new toungue after the first sip. and watch my doughnut be made and roll off the rack. HOT doughnuts are the best except when the icing starts cooling off on your finger tips. Is it the grocery store marketing that destroy buisness. I know I dont want to have to wait in line for my doughnut at grocery store. Have you ever done anything with a doughnut? I like dunking mine in milk and getting made that I left part of it in there too long and it drops off and sinks to the bottom. Do you order different flavors or fillings or feal cheap because you only buy doughnut holes or think you will get less calories if you buy it that way? You're mean. Ours closed a year ago, now we have to drive across the valley to get some. It's 145am and their closed. You're mean! I so ditto that brikag!!! 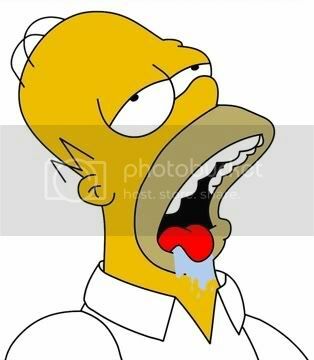 It is 3:14 and can not get a Krispy Kreme finger licking, lip smacking, donut.... Just plain mean...... love my Krispy Kreme donuts!! They truck them in down here. Sunny, I read your post, and I sense a bit of desparation there. 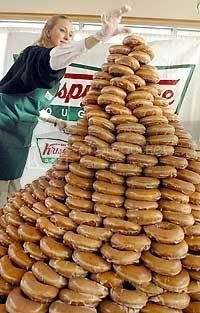 Will you be alright or should we send in the Krispy Kreme Withdrawal Team?? You asked if we do anything with our donuts. We used to have a little donut shop that made cake-type donuts. I'd take the plain ones and put them in the oven for a bit. They'd get crispy on the outside and warm and tender on the inside. Yum-my! Oh my.....I have to stay far away!! I'm a Krispy Kreme monster!! I can never stop with just one. We have 3 in Orlando. I try to look the other way when I'm passing them! There's just nothing like some hot Krispy Kreme's and a big glass of milk! Oh we were so happy to see them up here in the north. While I like Krispy Cremes I also have an affectionate relationship with Dunkin Donuts. It's the Apple Cinnamon they they have that's gets me going. 2-3 times a year I make a stop for a 6 pack. Usually none make it home. That's why only 2-3 times a year. Krispy Cremes are sold in my parts at the convenience store where I buy fuel & aren't as fresh as either the Dunkin's or the ones from our local Publix bakeries. I think at the moment there is a stop planned tomorrow for Dunkin Donuts on the way to Orlando. Let's hope I don't make a stop at both places. I may get flamed here but I can't stand Krispy Kreme donuts. Now I'll admit that I've never had them fresh, just the ones shipped into the gas stations around here. I used to work for a Super America (gas station) here in MN and we had our own bakery (SuperMom's) that is based in Minneapolis and we would get our fresh made donuts delivered daily. Those were the best. I used to stay up late just to go buy a half dozen or so as they came into the store. Of course our donuts were bigger and a little cheaper than Krispy Kreme's so to me it was a no brainer to get more calories for my buck! I used to live only a half mile from a Krispy Kreme and never even went in there. I'm not much of a doughnut lover. You just had to mention the "K" word didn't you SunnyKayak? Now I must have some.